This DIY project is for your favorite cook, dog lover or both.. I created this project with a good friend in mind – she is a a busy mom, a great cook and is the owner of a very unique dog. I have know them both for many years. 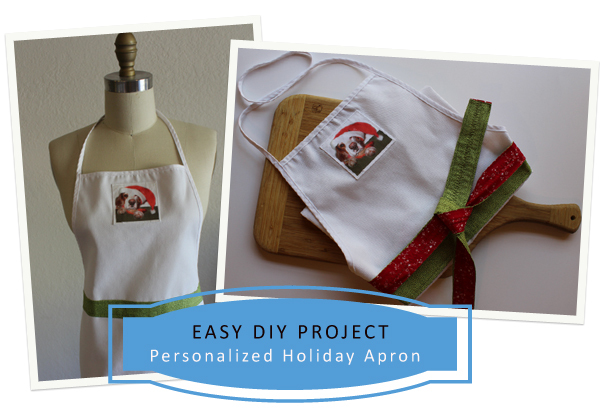 Her dog Benny is quite the character and I thought he would be the perfect model for my 2012 Happy Holidays Apron. This apron is super easy to make. It is a great gift for someone special in your life – it is useful, personalized and sure to make the recipient smile for years to come. This project was made with a store bought apron. You can choose how much or little you want to customize the apron. My whole project didn’t break the bank – store bought apron, fabric from my closet and image transfer paper [ I had to buy the paper]. To update the apron, I chose to add colorful waist ties and a fun picture of my friend’s dog . Gather materials. I bought the apron from Joann Fabric and Craft Stores for under $5.00. I usually like to sew everything, but the apron was inexpensive and made this DIY project something even a non sewer could do..
Measure the length of the apron from 1 waist tie end to the other end. Using that measurement – cut out 2 long strips of fabric 2 1/4″ wide by the length measurement. Cut 1 strip in your front/self fabric and another in your back/lining fabric. Turn and press the seam allowance of the straps approximately 1/4″. Do this for both front and back pieces. Pin down at the waist across the front of the apron. Make sure the strap is level at the waist from side seam to side seam. Note -new strap should also be level with the original apron waist ties. Sew down the strap from side seam to side seam. Pin the back/lining strap to front strap. Starting at the side seams – sew the front and back straps together. Transfer the image onto your fabric. There are a few options for transferring the image. You can use Avery products or The Electric Quilt Company. Cut the image to size leaving at least a 1/4″ seam allowance around all sides. Press and turn seam allowances under. Pin dto chest area of apron. Make sure the image is aligned with the top edge. Sew down the 4 sides of your image. That’s it – Happy Holidays everyone. Like! a perfect project for the beginner sewer!! well thought out!